The Ohio State University's roots go back to 1870, when the Ohio General Assembly established the Ohio Agricultural and Mechanical College. The new college was made possible through the provisions of the Land-Grant Act, signed by President Lincoln on July 2, 1862. This legislation revolutionized the nation's approach to higher education, bringing a college degree within reach of all high school graduates. The Ohio Agricultural and Mechanical College opened its doors on September 17, 1873. The college's trustees located the institution on the William Neil farm, approximately 2 miles north of Columbus' city limits. This site was chosen for several reasons. First, Columbus was central to the state and easily accessible to most state residents thanks to canals and railroads. Second, this more rural location would prevent students from frequenting bars and gambling houses located within Columbus' boundaries. Finally, a spring existed on the Neil farm, which would provide campus residents with an adequate water source. The institution was to enhance Ohioans' agricultural and mechanical practices knowledge, originally a majority of the trustees and faculty at the school placed more emphasis on liberal arts education, frustrating Ohio State Board of Agriculture board members. Norton Townshend, the Board of Agriculture's secretary, favored a "narrow gauge" education, with the college and its faculty providing instruction in new agricultural techniques. Joseph Sullivant, a member of the board of trustees, preferred a "broad gauge" education. Under this type of system, the college would offer agricultural and mechanical courses but also provide students with English, foreign languages, political science, history, and other fields. This broader curriculum ultimately triumphed and led the Ohio Agricultural and Mechanical College in 1878, to change its name to The Ohio State University to reflect the range of courses being offered. The first class had 25 students. By 1877, more than 200 students attended classes. Today there are over 50,000 students attending the Columbus campus and has granted almost 600,000 degrees. One of the richest traditions at Ohio State is Ohio State's Buckeye Football. Other cities have professional football team, but nothing beats the spirit of Ohio State Football. On a Saturday afternoon in the fall, the entire town goes bonkers. It's one of the things that makes Columbus feel like a small town where everybody is rooting for the local high school team, except the Shoe seats 100,000+ and there's not an empty seat in the stadium whenever there's a home game. The entire week before the big Michigan vs Ohio State game, it's nothing but 24/7 football madness. So we'll fight to the end for O-hi-o. How dearly we love O-hi-o. To love the better, O-hi-o. As sturdy sons of O-hi-o. The Ohio State University is one of the largest universities in the country. The Columbus campus resides upon 1755 acres of land. Total acres for all of the branches is over 15,600 acres. The Ohio State University has the highest enrollment of any university in the country with 51,818 students. Next to OSU is Arizona State University with 51,234 students. On the main campus in Columbus, there are 471 different buildings and a total of 928 buildings on all the various campuses through out the state. 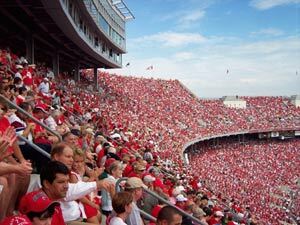 This past year 2005-2006, The Ohio State University received over $589,000,000. Gordon Gee is the president of the university and is serving his second term in that position. 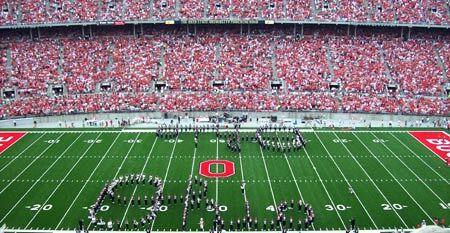 If you want Ohio State Buckeye souvenirs, then go to Conrads College Gifts has the largest selection of Ohio State souvenires and gifts in Columbus. Monday to Friday: 9:00 A.M. to 8:00 P.M.